Serena St. Clair dies while trying to rescue a mother and her young daughters from a horrible car crash in which the only survivors are the two children. Serena finds herself "recycled" as a newly minted guardian angel selected to follow Hollywood's latest star, Nick. Trailing him one night, Serena finds herself in a nightclub known for illegal activities and meets the owner, Julian, who is immediately taken with her. She also has feelings for him, even though she recognizes his incarnate evil as a demon. The story mostly takes place over a week in Las Vegas as Serena tries to save Nick from himself and his demons--both literal and figurative. Serena doesn't realize her superiors have other plans for her. And that is all I am going to tell you about the plot since you MUST read this one! This latest trend of angels and demons is really an age old story about good versus evil. Chong delivers on that story, but like a musician, she twists the words so that while the melody may be the same, it is a completely different song. The characters of Serena and Julian mesh so perfectly together that is like music when they interact. I love how she shows that they each have elements of good and evil existing within themselves and nothing is black or white when it comes to redemption. So this could have been just another angel story and luckily it doesn't. I read this in one night and can't wait for the next book in this series since there are many other characters that can be developed. WANT TO WIN THIS BOOK (arc)? This ends 10.19.11 midnight Pacific Time and the winner will be chosen by Random.org on 10.20.11. This giveaway is sponsored by Mira and me for ONE WINNER. Awesome. This book is on my wishlist and I really have been wanting to read it. Thanks so much for the giveaway! This book looks so good. Please count me in. Thanks for the giveaway. Great giveaway.Thanks for the chance to win it. I love the cover of that book and her pug is sooooo cute! Thanks for the giveaway. Oooooh! I can't wait to get my hands on this one! Sounds amazing! This book sounds amazing! I love Demon/Angel books! Love the cover too! Thanks for sharing today! I have been stalking this book for a while and would love to read it :) Thank you for the awesome interview, review, and giveaway opportunity. Sounds like a great book, thanks for all the recent posts and giveaway! Looking forward to reading it. Oh I really want to read this book! The story sounds pretty good! Thanks for the giveaway! Daily entry 10/9 thank you! Please count me in for a chance to win. 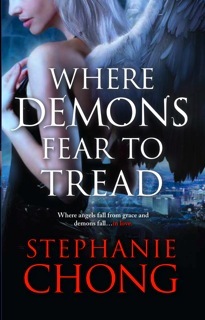 I'd love to win Stephanie's book. Daily entry 10/17 thank you! It looks like a really good book, adding it to my reading list.